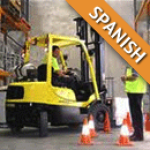 This Forklift Operator course, taught in Spanish, provides workers with a workable strategy for decreasing accidents while increasing general awareness on the purpose, use, regulations, and hazards of operating forklifts and other powered industrial vehicles. OSHA estimates that tens of thousands of employees are injured or killed annually due to forklift accidents. In 1999, because of serious concerns about forklift accidents, inuries and deaths, OSHA updated its regulation regarding Powered Industrial Trucks. This is the OSHA powered industrial truck training (for forklift, scissor lift and aerial lift) pursuant to 29 CFR 1910.178.